Singapore Book Council is looking for passionate and capable volunteers for the Asian Festival of Children’s Content 2018 from the 6 to 8 September 2018. The Asian Festival of Children’s Content (AFCC) is a festival that aims to celebrate and promote the creation and appreciation of children’s books and content, with a focus on Asian themes. Held at the National Library, AFCC will feature Singapore as the Country of Focus this 2018. Energetic and positive individuals are welcome to join in ensuring that the festival runs smoothly. – Applicants must be aged 18 and above. Applicants below the age of 18 must gain consent from a parent/guardian and submit a consent form prior to the event. – Successful applicants are required to attend a pre-event briefing and must be able to volunteer for a minimum of 8 hours from 6 to 8 September 2018. – Experience in events management preferred, but not strictly necessary. – Experience what it’s like to run a festival and go behind-the-scenes and have the opportunity to make new friends. – Volunteers will receive a complimentary Festival Pass for each completed day of duty during the festival. – Volunteers will also receive a Certificate of Appreciation, in recognition of their contributions to the festival. All selected volunteers would be required to attend a compulsory briefing on the 3rd week of August (Date and time to be confirmed). 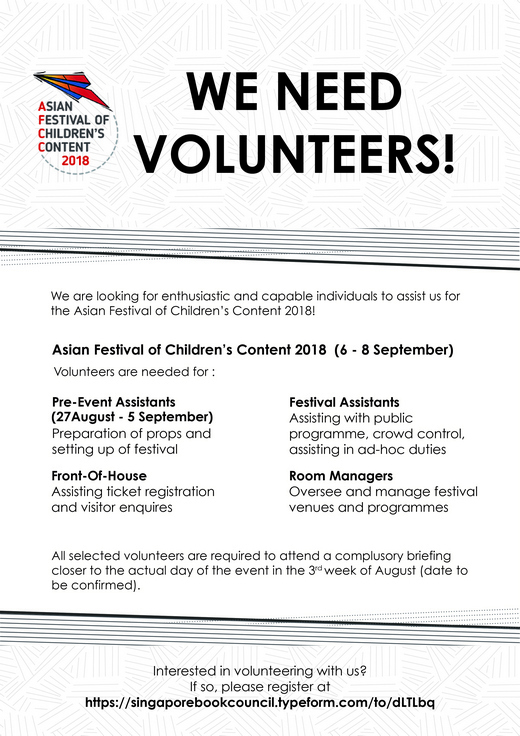 The call for volunteers for the Asian Festival of Children’s Content 2018 ends at 11 August 2018.